Give your home or place of business a deserved transformation with quality wooden floor installation that lasts for years afterward. 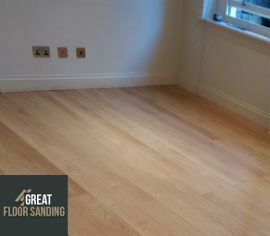 What you get from the floor fitters in Enfield EN is skill, precision, and experience to lay down every type of floor. You have complete control over the process from the moment you pick up the phone. And with the numerous design options, the end result is going to be exactly what you were after. You Make an Investment: A high-quality wood floor raises the value of your property – great news if you ever consider selling. You Express Yourself: You have the creative freedom to select a floor type (hardwood, engineered, laminate, parquet) and style that best represent you. You Get Something that Lasts: We work with longevity in mind, which is why we only buy the highest quality oak, cherry, ash, maple, pine and walnut on the market, for our projects. First, we send in a team of experienced wood and parquet floor fitters to perform a no-obligation on-site consultation to determine the layout. Why Should You Choose The Wood Floor Fitters in Enfield? Floor installation is a not a simple process as it requires skill and expertise to execute properly. All members of the staff of wood floor fitters in EN have long experience working in the industry and have seen the successful completion of numerous floor installations. You can be sure you’re hiring true professionals who use only the top equipment and premium materials to do the job. In the end, you get a wood floor that looks amazing and has been made to last for decades. Order Work from The Floor Layers in Enfield EN Now! Communication remains our top priority, so dial 020 3404 9697 whenever you have the opportunity to. You’ll find our support staff work around the clock from Monday to Sunday to ensure you get all the attention you need. You can request your no-obligation on-site inspection from the Enfield wood floor layers or you can request additional information about our services – we’re here to help. Additionally, you have the opportunity to change an already existing appointment, but only if there are more than 24 hours before the appointment.